I've been thinking about turtles a lot lately. I'm mildly entertained how an obsession starts. Something sparks a thought, then like a Bon Jovi song, it gets stuck in your head. These turtle thoughts have been so prevalent that this morning I decided to not just think it, but to analyze it. "Why the heck do you keep thinking about turtles?" It started 3 weeks ago when Abe sent all of us this funny youtube video. Actually I take that back. It really started 3 months ago on a trip to Isle Mujeres, Mexico. While on this island Ray and I went to a turtle preserve and hatchery. It was a disappointingly small preserve, but it was the spark none the less. Not much of importance happened at this preserve except I did learn that Ray feels rules are meant to be assessed, then maybe followed. I also learned a portion of lemming still hibernates in me. It started out like this. I thought he was just looking, but then I realized he was just waiting for all the people to leave. It progressed to this. Just a finger in the water. Then a finger in the water stroking their backs. I look away for a minute and return to see he has a knee up. Then he does it. He goes all-the-way. I was panicking because these signs were everywhere, and I'm categorized with the Rule Followers. Rule Followers don't pick up turtles at turtle preserves. Rule Followers don't even need signs. They just know. The little bit of lemming in me was exposed by me taking pictures of it all. THEN, Abe sent us this youtube video. I know it's a long video, but it is SO worth watching. Cali: That was funny. I found the man quite endearing. He just loved his simple life and snapping-turtle-catching is a true talent. You go Turtle Catching Man. Abe: My favorite part was when he said, "Sometimes I scare up snakes." And the camera man replies, "... and typhoid." And he said back, "Nope, just mostly water snakes." Ande: He reminds me of Smeagol from Lord of the Rings. Endearing yes, like how Smeagol is endearing. I love people. Mom: Yeah, I agree with Cali about him being "endearing." That's why I was nervous he was going to pull up a crocodile instead. You just have to love and appreciate a man that lost his front teeth to a chainsaw and doesn't mind green pond slime on his cheek. The image of him telling us how he lost his front teeth from a chainsaw made me laugh outloud yesterday... and it's been 3 weeks since Abe sent the video. Anywho, this video has added to the rampant turtle thoughts. THEN, I saw a documentary on reptiles this week. That's where I learned about Lonesome George. 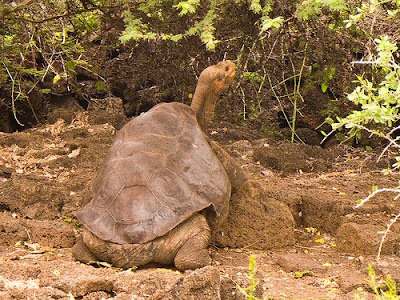 He is a Pinta Island Giant Tortoise from Pinta Island of the Galapagos. He was found in 1971 by a snail biologist, after it was believed that all Pinta Island Tortoises had been extinct for over sixty years. He just wandered out from wherever he'd been hiding and declared himself the last survivor. He's 60-90 years old and could have another 50-100 years of bachelorhood life left. I thought it was humorous that one of the reasons these giant tortoises were extinct was because sailors found out that they can live for up to a year without any water of food. They would haul them onto their ships for fresh meat. I just found it comical to picture a ship sailing in the ocean with giant tortoises wandering around the decks. So, from all this analysis, I realized that sometimes obsessive thoughts don't necessarily add up to something profound. They just consume a lot of thought space. Maybe waste is a better verb. I have 3 books on how to raise turtles/tortoises at the library waiting for me. This year... or at least in the next five years we are definitely deciding to take on the responsibility of a turtle. I'm pretty sure we're definite on this. Oh ho. That is funny. But Cali, the spark happened years and years and years ago. Remember when that was all you wanted for your birthday and you got Senora? Remember when your dad ran over a turlte and cracked his shell and brought him home and you wanted to glue him back together? Please dig further. I want to know what sparked turtles in you younger. Was it Yertle the Turtle? Was it the Little Mailman of Bayberry Lane that went to visit the turtle? Where oh where did the turtle thoughts begin? I thought the pictures of Ray slowly but surely "reassessing" each rule was funny. P.S. Did you remember that turtles stink? Or was that just the food Senora wouldn't eat? My favorite - "Rule followers don't even need signs. They just know." Yes they (I mean we) do! When Chance was a baby, one of my truck drivers rescued a turtle on his deliveries one day, and he lived in my pond in our back yard for a couple weeks. Never did figure out where he wandered off too, but I've always wanted another one. I love how you get obsessed about things. This post was so you. I think my favorite part was Ray's slow progression to picking up the turtle. I also like how you have three turtle books at the library. I'm excited to hear what you learn about them. What will you name your turtle? Senora is hard to top. "Rule followers don't even need signs, they just know." I could have SWORN that man was my neighbor until he mentioned Kentucky. Would have bet my life on it. I can't wait to show it to Jesse so that this time she knows how to catch one the right way. I love that Ray assesses each rule and then DECIDES if it should be followed. THAT is the way to live. I agree whole heartedly. But secretly I'm too scared and am mostly a rule follower by default. Cali, you've got a great talent for telling a story. Your pictures of Ray and Rules cracked me up! I had to show it to Micah. He said to me, should she write scripts for documentaries, they are good at withholding information until the very end. He's already scheming a plan for you in the 'movie world' with him-JK. Turtles rate an 8 for interesting. Turtle Man rates an 8.5 but mostly because of his missing teeth. However, Ray rates a 10 for breaking the dang rules! He's the one that makes it so hard on the rest of us who are religiously following them....it just makes our guilt climb that much higher. Why is that??? Remeber the turtles in Hawaii and how it was illegal to touch or swim near them? They were always so cool to watch in the waves from the beach. And then we found the dead one on the beach and it smelled bad. Really bad.